Device closure of secundum atrial septal defects (ASDs) has proven to be safe and effective with high success rate, and it is rapidly becoming the standard treatment for secundum ASDs. Immediate or late device embolizations are potential complications of every attempted ASD device closure. We report a case of an asymptomatic embolization of an amplatzer septal occluder (ASO) into the left ventricle outflow tract (LVOT) detected by routine transthoracic echocardiography 1 week after primary successful implantation in a stable patient, requiring emergent surgical removal. A 14-years-old female, known to have a secundum ASD, was referred because of progressive decrease in exercise tolerance. 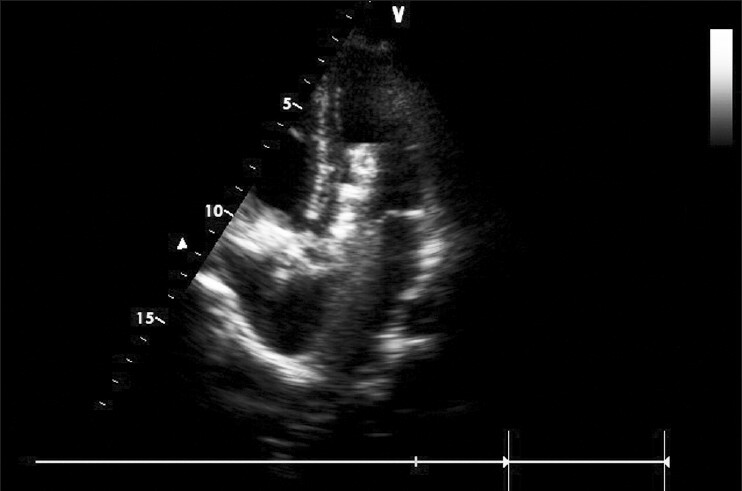 Transthoracic echocardiography revealed a secundum ASD with a left to right shunt and moderate right-sided heart enlargement. Transesophageal echocardiography (TEE) demonstrated a 20 mm secundum ASD with adequate rims. ASD's morphology was suitable for percutaneous closure. Procedure was performed under general anesthesia, transesophageal echocardiographic, and fluoroscopic guidance. The defect was balloon sized using the stop-flow technique and the stretched diameter was 21 mm. A 22 mm size ASO (AGA Medical Corporation, Plymouth, MN, USA) was successfully delivered and seated on the atrial septum without any residual shunt or significant systolic-diastolic movement and a good positioning at the final TEE and fluoroscopic control. The patient was immediately extubated and monitored in the intensive care unit for 24 h. Early postprocedural care was eventless and the patient was discharged at third day after transthoracic echocardiography showing the ASO at the middle of the atrial septum. Medication at discharge was Aspirin 160 mg once a day. On routine follow-up examination 1 week after initial implantation, patient was asymptomatic with silent precordium. 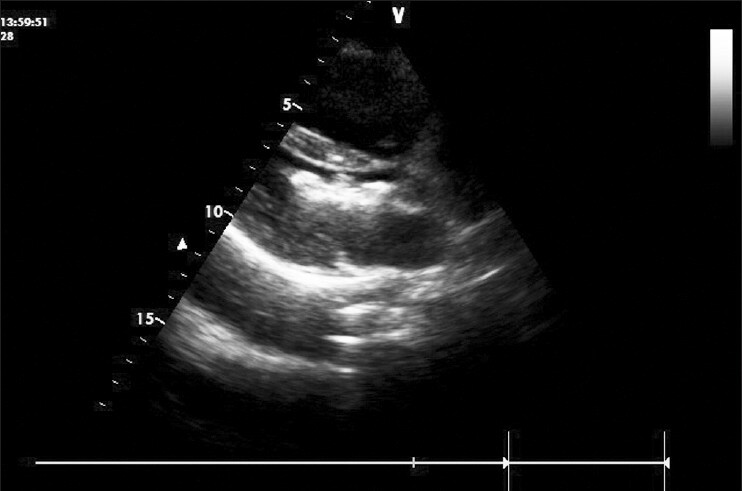 Surprisingly, transthoracic echocardiography showed the ASO dislodged and vertically trapped in the LVOT without any obstruction [Figure 1] and [Figure 2]. Immediately, patient was referred for surgical removal. 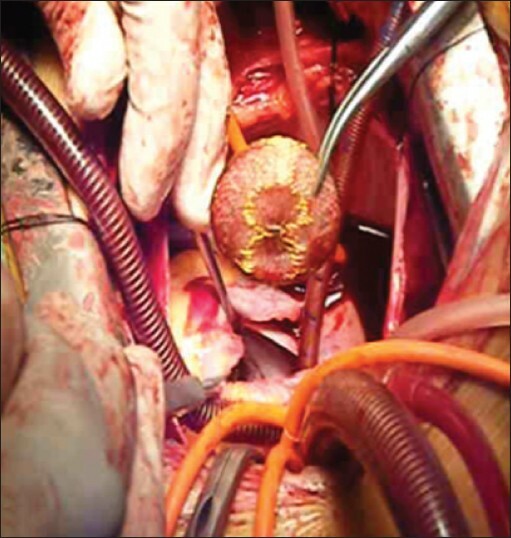 After institution of cardiopulmonary bypass, a longitudinal right atriotomy was performed. The edges of the ASD were retracted and the device was detected under the anterior leaflet of the mitral valve. The device was gently detached from the chordae and retrieved [Figure 3]. Mitral valve, leaflets, and chordae were examined carefully for traumatic injury and no pathology was noted. All ASD rims were adequate on peroperative examination. ASD was repaired with the running suture technique. The postoperative course was uneventful. Device embolization is a potential complication of every attempted ASD device closure. It generally appears to occur within the first hours after implantation. Although some authors have reported cases of delayed device migration. There may be several factors that may help to predict an increased risk for device embolization. The main causes of migration are large defects, inadequate defect rims to hold the device, undersized device diameters, and inadequate operator identification of proper device deployment. Adequate identification of proper device deployment in all the ASD's margins before device release is a crucial step of device closure procedure. Because of the three-dimensional character of the atrial septum, an ASD is difficult to image in its entire profile without three-dimensional reconstruction. New imaging technologies like 3D TEE or intracardiac echocardiography can be helpful for adequate ASD margin's assessment, proper device delivery and release and postclosure assessment. A close understanding with an echocardiographer experienced in this area is of great benefit. In our case, device undersizing and our initial experience with percutaneous ASD closure seem to be the main reasons for its embolization. Our patient did not develop symptoms after embolization because the position of device in the LVOT was in the longitudinal axis and parallel to the direction of blood flow. As the device was trapped into the LVOT, it would have been dangerous to use the transcatheter technique in our patient. ASD device closure can be associated with failure and, most importantly, with life-threatening complications. Thus, proper selection of patient and device is mandatory. Close monitoring and facilities for safe emergency removal, percutaneous or surgical, should be available for all patients. 1. Du ZD, Hijazi ZM, Klemman CS, Silverman NH, Larntz K. Amplatzer investigators. Comparison between transcatheter and surgical closure of secundum atrial septal defects in children and adults: Results of a multicenter nonrandomized trial. J Am Coll Cardiol 2002;39:1836-44. 2. Fischer G, Stieh J, Uebing A, Hoffman U, Morf G, Kramer HH. Experience with transcather closure of secundum atrial septal defects using the Amplatzer septal occluder: A single center study in 236 consecutive patients. Heart 2003;89:199-204. 3. Ussia GP, Abella R, Pome G, Vilchez PO, De Luca F, Frigiola A, et al. Chronic embolization of an atrial septal occluder device: Percutaneous or surgical retrieval? A case report. J Cardiovasc Med (Hagerstown) 2007;8:197-200. 4. Levi DS, Moore JW. Embolization and retrieval of the Amplatzer septal occluder. Catheter Cardiovasc Interv 2004;61:543-7. 5. Lodato JA, Cao QL, Weinert L, Sugeng L, Lopez J, Lang RM, et al. Feasibility of real-time three-dimensional transoesophageal echocardiography for guidance of percutaneous atrial septal defect closure.Eur J Echocardiogr 2009;10:543-8. 6. Shirodkar S, Patil S, Pinto R, Dalvi B. Successful retrieval of migrated Amplatzer septal occluder. Ann Pediatr Cardiol 2010;3:83-6.